I was listening to a podcast this morning about scapulars on the way to work, and I thought maybe I'd address one or two of those that I had never heard of before (there is a lot more out there than just the traditional brown scapular; who knew?). In my research, I came across some interesting little factoids that led me in a completely different direction. I love when God works like that. So I *did* know that some religious orders have their own scapulars, although I did not realize how many and how varied they are. Technically, scapulars are the long, draping pieces of fabric nuns and monks wear over their habits, and lay people can wear smaller versions that you wear around your neck and tuck under your shirt. The small ones we're used to seeing have specific images that have meaning to the particular order from which it originated. I knew that the Dominicans have a white scapular (they have a black and white habit), so I thought maybe I'd look into writing about the Dominican scapular. I picked out the Dominicans because I am a Third Order Dominican. Wait, is this a big revelation?! I've been a Third Order Dominican for just over 10 years. I'll talk more about my story below, but let me continue on my journey this morning for today's post topic lest I get off track. (snort!) My Google search led me to the third order Dominicans home page, and I thought, "oh, I should write sometime about how I'm a Third Order Dominican." 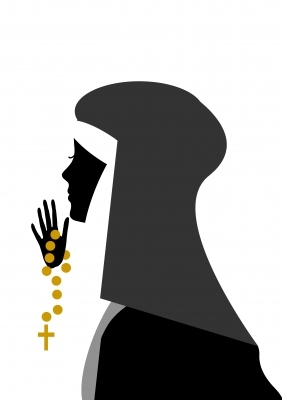 My reading led me to the Dominican saints page, of which St. Catherine of Siena is always a featured member (and she was a member of the Third Order, NOT a nun, interesting no?) and I noticed that Bl. Pier Giorgio Frassati was also on the page. *God-incident moment* I'm currently on day 2 of a novena to Bl. Pier Giorgio Frassati since his feast day is coming up at the beginning of July. 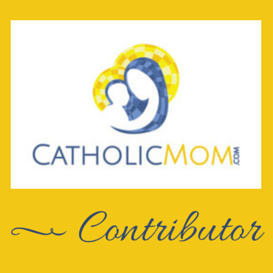 Emmy is hosting it over at Journey of a Catholic Nerd Writer for anybody that is interested. That sealed it. I knew that I should write about Third Orders. So, what the heck are they? Third Orders are lay members of a religious order. They do not live in community, but dedicate themselves to the charism of the order and usually meet regularly for prayer and helping out at the local convent/monastery where their chapter is affiliated. The members apply the order's spirituality to their specific vocation, whether it be to the married or single life. The major religious orders all have them: Dominicans, Franciscans, Benedictines, Carmelites, etc. There is generally a discernment process to become a Third Order member for a number of years prior to making a vow as a professed member. You learn about the order and practice whatever devotions that order is dedicated to. Then you make a vow to live as Third Order member for the rest of your life. This was always very appealing to me. Once I knew that I wasn't called to be a nun, the thought of being a lay member of a religious order (which are so interesting with all of their different charisms, devotions and traditions) looked like a great opportunity. I called the 3 communities with Third Orders in my area once I returned home from law school: Franciscans, Dominicans and Carmelites. I figured I'd check them all out and then discern which I felt called to. Before I even heard back from any of them, I had a clear favorite: the Carmelites. I'm devoted to many Carmelite saints, and the contemplative nature of their spirituality really appealed to my introverted side. Other people who like to keep silent and to themselves? That's the one for me! I also loved many Carmelite devotions like the brown scapular, the Infant Jesus, St. Therese's Little Way, and The Little Office of the Blessed Virgin Mary. I never heard back from the Franciscans, not sure what happened there. But I did hear back from both the Carmelites and the Dominicans, who invited me to come to a Mass and Third Order meeting and see if I felt called to join them. I was thrilled. My first stop was the Dominicans. There is a Dominican convent here devoted to praying a perpetual rosary, and indeed the rosary is a special devotion for all Dominicans. This I liked. Their chapel was absolutely beautiful, with a screened area off to the side of the altar through which you could see the cloistered nuns during Mass. And Mass, in the Ordinary Form, was very reverent. No Extraordinary Ministers of Holy Communion there, no sir. The entire congregation waited while the priest first distributed the Eucharist to the nuns via a small window in their grille, and then he (and only he) came to distribute it to the rest of the congregation, an altar boy holding a golden paten to assure that the Host did not accidentally fall to the floor. Just beautiful. After Mass, the chapter gathers together, and my "potential Postulant mistress" was an older woman named Florence whom I'll never forget. The *sweetest* most enthusiastic Dominican you ever could meet. Her passion alone made me want to become a Dominican. I wasn't totally sure at the time, because, well, I was the youngest person there by A LOT. I wasn't sure if I "fit in" if that makes any sense. I did like the Dominican devotion to the rosary, to the Passion of Jesus (via the Sacred Heart, the Holy Name, and the Precious Blood), and to praying the Divine Office. The Dominicans are also known as the "scholarly order," including many voracious readers and philosophers. That fit me. But they are the "Order of Preachers" and I wasn't sure that fit me exactly. I did like a lot about the Dominicans, but I felt sure that my calling rested with the Carmelites. And you know how it goes when you feel sure of something. It often does NOT work out the way you plan. I went to visit the Carmelites. They had a similar setup to the Dominicans in that we attended Mass and then the chapter met. And holy smokes, the MASS. I mean, it's like comparing two spectacular diamonds to each other because Mass at the Dominican chapel was also so fantastic, but I've never been to a Mass during which I had the reaction that I did at the Carmelites. It's a beautiful chapel, to be sure, but the cloistered nuns are completely invisible to the congregation behind a shrouded black grille. But you can *hear* them praying and chanting, and my God, it was unforgettable. It lent this aura of mystery and sanctity to the whole experience that is incomparable. I was enraptured. And the meeting afterward was great. All these years later, I don't remember much about it, but the people were nice and I left happy. So, based on this, and given that I was already leaning toward the Carmelites anyway, one would have thought that I started studying to become a member of the Third Order Carmelites (called Secular Carmelites), right? I kept going back, and the more I learned, the more I liked the Dominicans. I wasn't yet thinking of becoming a librarian, but I was drawn to the Dominican love of reading and learning, and I realized that the call to be an Order of Preachers for lay people doesn't mean that you go looking for verbal confrontations with people; instead, you are called to be a quiet example with your life. Now THAT I can handle (or try to). Next thing you knew, I was progressing in my training to become a Third Order Dominican. It just seemed to fit, and it felt right. I've never given up my love for the Carmelites, but I felt called to be a Dominican. Ultimately, Rose and I both made vows as Third Order Dominicans, and she lives one street over from me. With the demands of young children, we haven't be able to make chapter meetings in some time (we both felt self- conscious bringing our rowdy toddlers with us to the *very quiet* Mass and meeting, but yet didn't want to leave the children out of Mass for that week) but I'm looking forward to getting back to the meetings eventually. In the mean time, I remain devoted to the Dominican charisms, it's very enriching. Thank you for sharing this! I have pondering how to belong with a group of Catholic women in my area. I could really use the support. I see this as one way of meeting more Catholics. Again, thank you! Very informative post! Since I've become interested in Catholicism, I initially felt called to the Benedictines and read about their third order program, but haven't done anything about it yet. I'd love to hear, as a mom (I am too), how you do work some of their devotions/practices into your day/week. Thanks! Greetings from Indonesia! I have a similar experience with you on discerning third orders! At first I was sure about Carmelite but then I found that Dominican was the one for me! I'm still an aspirant, but I'm so excited about my new life! Lots of things to learn from my Dominican brothers and sisters like you! Hey Tiffany! I'm so glad to have found your blog. I'm going to be starting a postulancy soon with the Lay Dominicans in my area, but it seems there aren't any other young moms in the chapter I can talk to. Can we become internet buddies? :) My business email is mothermerryknitting@gmail.com. If you get the time and wouldn't mind, could you send me a message there??? Pax et bonum! Hi Christina!! I sent you a message. :) Welcome! And yes, I would love to keep in touch with you online!